AP Passing of Salary/Pension bills of July-18 on or before 26/07/2018 as per Rc.No:7668/AP Passing of Salary/Pension bills of July-18 on or before 26/07/2018 Order Issued as per Rc.No:H5/7668. 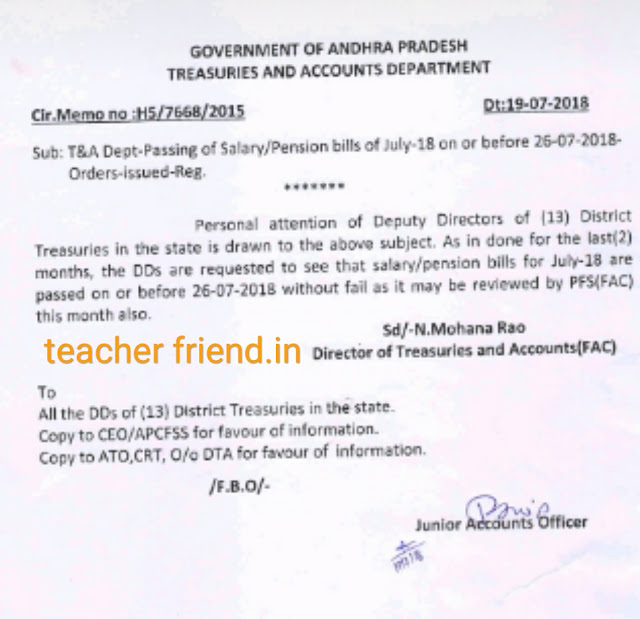 AP T&A Dept-Passing of Salary/Pension bills of July-18 on or before 26/07/2018 Order Issued as per Rc.No:H5/7668, Dated: 19-07-2018. AP Passing of Salary/Pension bills of July-18 on or before 26/07/2018 as per Rc.No:7668. Personal attention of Deputy Directors of (13) District Treasuries in the state is drawn to the above subject. As in done for the last(2) months, the DDs are requested to see that salary/pension bills for July-18 are passed on or before 26/07/2018 without fail as it may be reviewed by PFS(FAC) this month also.